Meiringspoort is the spectacular final product of geological processes that have taken place over more than 200 million years. Here it is clear how the sandstone layers of the Cape mountains were lifted up, pleated and folded back and forth. Terrestrial forces, greater than'we can imagine, created an impressive home for a wide variety of living organisms in this area. Certain plants and animals have evolved so much over thousands of years to be able to survive, that they are today acknowledged as unique species that only occur here. The plant diversity of Meiringspoort is one of its considerable attractions. The species diversity is so high that, for a similar sized area elsewhere in the world, it would be difficult to rival. Some of the plant species in Meiringspoort are known throughout the world. In 1689, Hendrik Oldenland collected the wild geranium (Pelargonium zonale) that occurs here. Seeds and cuttings were later sent to Europe where the Duchess of Beaufort in England was cultivating them by 1710. Over the years they have used our wild geranium for selection and to breed hybrids. It is still known today as one of the important parent plants of the massive geranium industry in Europe and America. Meiringspoort forms part of the Swartberg Nature Reserve, which is managed by Cape Nature Conservation. This reserve comprises about 120 000 hectares and includes most of the mountainous area on both sides of the Poort. The larger animals that occur here are seldom seen - probably because of the busy main road. However, a variety of birds and smaller animals, which are not frightened off by the busy road as easily, are seen regularly. One must drive particularly carefully close to the northern tip of Meiringspoort at night, as kudus often cross the road in this area. Car lights blind the kudus and they then tend to try to jump over the car. Respect the environment and please abide by the relevant regulations. Cape Nature Conservation would like to keep this area in a good condition for you and other visitors. Meiringspoort took shape about 250 million years ago when Africa was still part of a larger continent, which together with Australia, South America, Antartica and India, was known as Gondwanaland. An inland mountain range was formed by lateral forces which, by pushing against each other, gradually heaved up layers of rock. At first, water from this old mountain range drained towards the north. These streams cut ravines into the northern slopes of this mountain range. About 100 million years later, Gondwanaland broke up and the adjacent continents began to drift away. The rock formations of the mountain range toppled to the south. New rivers formed ravines in a southerly direction. Another 120 million years later, the mountain range was heaved up again, causing streams to cut deeper ravines in the mountain. The gradual distortion and upheaval of the earth's crust formed the Swartberg range, with Meiringspoort ravine cutting through it. At least three different formations of the Table Mountain Sandstone group are visible near the waterfall. The Tchando formation at the top, a narrow shale band of the Cederberg formation lower down and below it, a much folded cliff which consists of a 75 m layer of Peninsula sandstone. These different formations differ in drainage pattern, the degree of erodibility and nutrient content. Different plant and animal species occur on each of them. The variation in the geology is therefore one of the reasons why such a great diversity of plants and animals occur in this region. The animals vary from small field mice, such as the Cape spiny mouse, to the shy leopard, which is not often seen. Dassies (Cape hyrax) are often seen when they sunbathe on the rocks or while feeding on the vegetation next to the road. Water mongoose live near the river or close to picnic sites, while klipspringer stay close to the higher slopes. Baboons often laze around close to the road. Please do not feed them! It is an offence because they become used to being fed and eventually become dangerous when they demand food from visitors. Most of the other animals avoid the busy road, but you might sometimes see caracal, Cape clawless otter, grysbok or large spotted genet at daybreak or dusk. 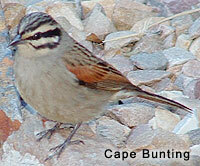 Of the 76 bird species that have been recorded in Meiringspoort, Cape bunting, Cape rock thrush and Cape wagtail are the most common close to picnic sites. Lesser double-collared sunbirds and malachite sunbirds stay close to the waterfall. Malachite sunbirds in particular love the nearly black nectar that is produced by the honey bush (Melianthus comosus). Remain on the lookout for black eagles. They are often seen hunting dassies. Other abundant bird species are the rock pigeon, Cape turtledove, laughing dove, Cape bulbul, Karoo prinia, red-winged starling and Cape white-eye. In summer you might see some of the bird species that migrate in winter, such as Alpine swifts and greater striped swallows. Three species of fish occur in the river, namely Cape kurper and two scarce and endangered red fin species, the small-scaled red-finned minnow and the slender red-finned minnow. The fins on the male, which becomes bright red in the breeding season, easily identify them. Currently, there are no alien fish species in the river. They can not be released here either as they are a serious threat to the survival of the rare red-fins. 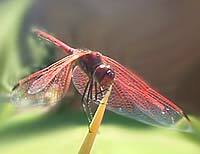 Insects form an integral part of the ecosystems in Meiringspoort - from the well- known dragonflies along the river to the hoard of strange little insects on the pebbles in the riverbed, the carpenter bees that hum around pease-blossoms to a variety of butterflies. Some of the world's most interesting beetle species also occur on the high peaks above Meiringspoort. Not swim in the river - people and animals that live down the stream drink this water! As a result of the many loose stones and rocks in the Poort, it is dangerous to walk on the mountain slopes and will only be allowed in special cases. There is a dramatic change in the vegetation from the Karoo to Meiringspoort. Tree and fern species that are more distinctive of the wetter Knysna forests occur inside the Poort. Mixed amongst these are Great and Little Karoo plant species, which in turn occur between the typical fynbos plant species. The rich variety of plant growth can be ascribed partially to the broken topography of the environment. This landscape creates various habitats, which differ with regard to the depth, drainage and nutrient status of the soil. The rainfall and degree to which fires can occur also differ from place to place. Adjacent habitats can differ totally. This is why surprising combinations of plant types, such as typical Knysna tree species and Great Karoo succulent species can grow here practically side by side. A large variety of shrub and tree species that are adapted to surviving regular floods grow next to the river in the Poort. These riverine vegetation, such as the Cape willow (Salix mucronata) and honey bell bush (Freylinia lanceolata) have flexible stems and elongated leaves that offer little resistance when submerged during a flood. Their special adaptations enable them to recover soon after a flood. Young trees that occur in and along the river initially also have flexible stems, but later develop a dense root system and strong stems that anchor them firmly. The sweet thorn tree (Acacia karoo), which prefers sweet, clayey soils, is abundant along the rivers outside the Meiringspoort but scarce inside the Poort, where the sandy soil is acidic and nutrient poor. Riparian plants play an important role in stabilizing the soil and rocks in the riverbed. Without this vegetation, the homes of birds, fish, insects and other larger animals, as well as the road, would be severely disturbed every time there was a flood. The vegetation on the slopes also varies considerably. 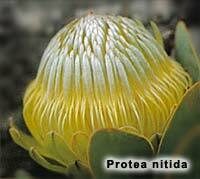 Fynbos vegetation, such as the waboom (Protea nitida), is found particularly on the cool, moist mountain slopes. Typical mountain fynbos is limited primarily to the higher slopes, but sections of it are visible close to the road. Little Karoo vegetation, which is sometimes mixed with Great African holly (Ilex mitis) does best in narrow protected gorges, while red alders (Cunonia capensis) grow in areas where underground water seeps perennially. Three of the plant species growing on the vertical sandstone cliffs are heath species (Erica species) and occur only in Meiringspoort and nowhere else in the world. Many questions about the plant diversity in Meiringspoort have not yet been answered, such as why the mountain cabbage-tree (Cussonia paniculata) occurs only in the northern half of the Poort, while the common cabbage-tree (Cussonia spicata) is restricted to the southern half. Meiringspoort was officially opened to traffic early on the morning of 3 March 1858 with a colourful procession and a tearful guest of honour - the champagne bottle only broke after the third attempt! The Poort was named after the influential farmer from De Rust, Petrus Johannes Meiring, who tirelessly campaigned for a road through the poort. This road opened doors for trading between the communities of George, Mossel Bay and Oudtshoorn and the farmers to the north. Tollhouses that were built also served as shops and dwelling houses and the first toll-keeper that functioned there for fifteen years became famous as the local herbalist and tooth-extractor! The boom in the wool trade had more than one million kilograms of wool being transported through Meiringspoort by 1870. To preserve the natural beauty of the Poort, as little blasting as possible was done when the road was tarred from 1966-1971. The stonewalls that maintain the character of the earlier road, were built by 480 migrant workers from the former Ciskei and Transkei. Some of the best anecdotes about Meiringspoort include stories about leopards roaming the ravines of the Swartberg Mountains, the "finger rock" pointing to the pool where a sinful couple drowned and New Year celeb shallow pools. 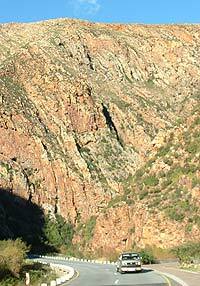 *Excerpts taken from Meiringspoort, a scenic gorge through the Swartberg Mountain Range by Helena Marincowitz.